Visiting Cham Island, tourist will be admire the sincere of the most beautiful Island in Hoi An which is recognize by UNESCO as the world’s atmosphere with lush forest, stunning beach. It consists of 8 small islands. It is the best place to who want snorkeling, diving, scuba diving, enjoy fresh seafood, and visit peaceful village and old pagoda. The local is both friendly, hospitality and helpful. Cham Island is an ideal place for tourist to overnight in here. It is absolutely safety to you sleep outside beach or in the local homestay. 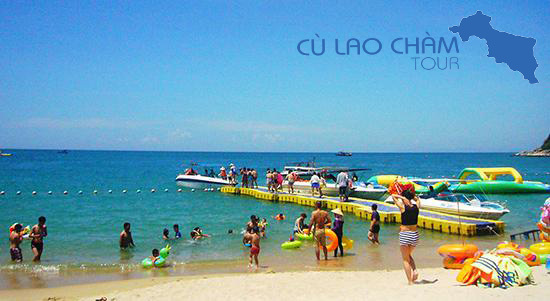 Let’s Cham Island Tour take you to discover Cham Island’s beauty. 07:45 Tourists will experience the journey to discover Cham Island where is recognized as the world’s atmosphere with lush forest, stunning beach and cute village. 11:00 Visiting and snorkeling with Coral species are only preserved in Cham Island. 12:30 Having Lunch with specialties seafood at the restaurant on the island. Free on sun chair, sun bathing and relax. 14:00 Speed Boat return guests back to the Cua Dai Port. Ending the program visit the Cu Lao Cham Island. 14:30 See off the guests back to Da Nang City. 10:00 Wooden ship will pick up tourists for the experience the amazing feeling of ” go Fishing at Cham Island” with the variety fishes of Vietnam- extra charge 150,000 / 1 bait and fishing rods (Applies for groups from 5 and more). * If booking confirmed please send us the list includes: name, date of birth, email address (if available) or mobile numbers to companies for buying insurance. √ Water (1 bottle 0.5 liter)/ person / day. √ Tips for waiters, tour guides and drivers. √ Children under 05 years: free (insurance charge 100,000Vnd/child). √ Children over 10 years old: 100% of the tour as adults.